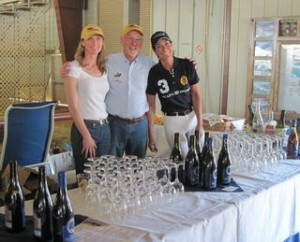 Joanne, Marvin, and Deborah prepare to pour wine at the Welcome Party. The Quailhurst team has returned home from sunny California with a renewed set of goals after competing at Golden State Dressage’s “The Premier” show at the Rancho Murieta Equine Complex. Thursday was also the first day of showing for the horses and… stay tuned for our next post about “The Premier” and the important things we gained from attending.